The Teaspoon Chandelier is a collection of souvenir teaspoons from a deceased estate that have been wired together to create a chandelier. This arrangement transforms the collection into a decorative object where the array of shapes and colours sparks curiosity to explore the relationships between them. On closer scrutiny we see that the teaspoons are mainly from country towns in NSW such as Mildura, Cowra, Katoomba and Harden. There are also some from holiday spots such as Port Macquarie, Byron Bay and Surfers Paradise. One series traces a trip from Brisbane up to Cairns, and there is a small sub-set from New Zealand and Fiji. There are also commemorative teaspoons from the Olympics in Moscow, 1980, Los Angeles 1984, and Seoul 1988. 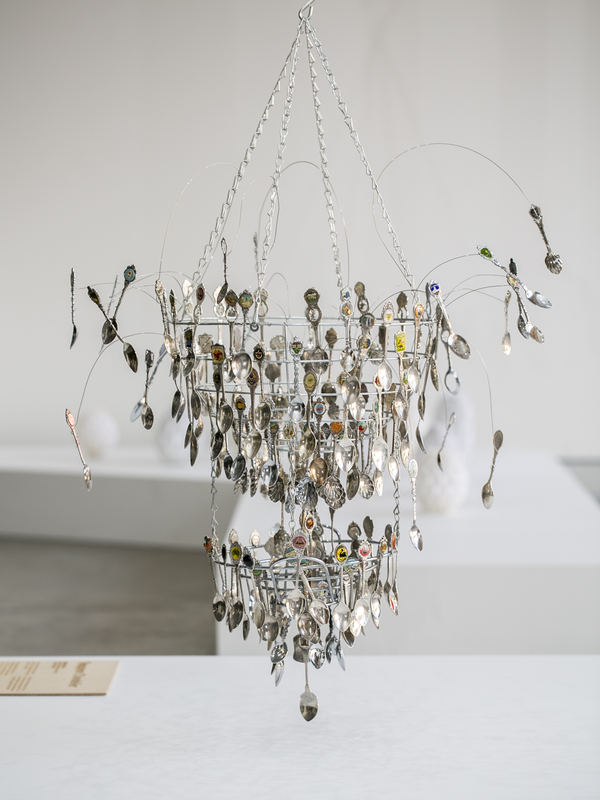 Stephen Barrass (2015) The Teaspoon Chandelier, curated by Prof. Angelina Russo, Mobile Makers forum at the University of Canberra on 30-31 July, 2015.